Manage a fleet of devices with a cloud-based EMM solution that increases business efficiency and secure corporate data. Knox Manage can manage any Android, iOS or Windows 10 device, but is most secure on Samsung Galaxy devices integrated with the Knox platform. Knox Manage’s cloud-based command center empowers IT admins to remotely manage and configure device settings. It doesn’t require any system integration, empowering admins to quickly and easily set up their corporate environment. 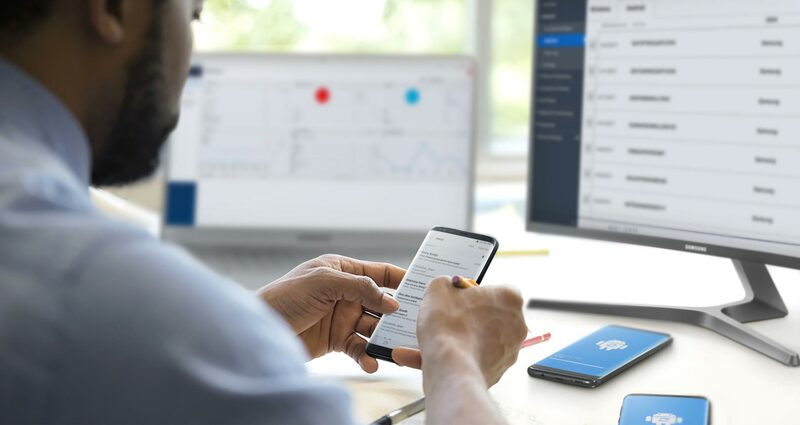 Leveraging the Samsung Knox Mobile Enrollment service, Knox Manage’s automatic client installation and enrollment, greatly decreases deployment time. And its built-in tools help users set up devices in kiosk mode with no additional development work. Smartphones are portable powerhouses, but with Knox Manage, an enterprise can restrict how these devices are used to prevent the leaking of confidential business data by employees performing unintended actions. More than 280 policies are available, including whitelisting and blacklisting apps or websites, as well as pushing required apps or files. Apply different policy sets based on time, when a specific app is running, and more. With user permission, monitor device location periodically. Knox Manage allows admins to lock the device to a specific app through kiosk mode. Knox Manage supports a full range of Samsung devices on Android, as well as other smartphones and tablets running Android, iOS, and Windows 10. Real-time device monitoring allows IT admins to track the current GPS-based location of all managed devices (with employee consent), and message all device owners without needing their phone numbers. If an employee encounters a problem while out of office, they can authorize IT admins to request direct access their device for easy troubleshooting. This allows IT admins to quickly help employees get back to work. And if a device is reported lost or stolen, IT can remotely locate it, lock it, reboot it, and wipe its content. Download the latest flyer for Knox Manage for feature highlights. Download the latest tech sheet for Knox Manage to see a comprehensive list of features. This virtual demo app for your smartphone or tablet highlights the benefits of using Knox Manage. View the full feature list of Knox Manage. See how you can use the event-based management feature to apply specific policies to user devices based on various events. See how you can set up user devices for specific purposes. Get access to the Knox Manage console and start a free full-feature trial.